Carol Marine's Painting a Day: "Stemless"
I've heard one report so far from a friend who saw the movie (mentioned yesterday). Apparently the bar scene happens so quickly, near the end of the film, my paintings are a blur. Ah well. For those of you who don't know why I'm in Germany, my husband was adopted from here when he was a baby. About two years ago he found his birth parents, still married. Earlier this year his birthfather died (at 85) and today was the funeral. We are here visiting his birthmother and today we also visited with lots of family. Unfortunately very few speak any English at all. My husband has been dutifully teaching himself German, but for me painting always wins out when I have any time. Tomorrow, hopefully, I will be able to paint. Sorry to hear the news about your husband's father. It sounds like he lived a long life. As far as cramming anything besides art in my brain, I'm with you there Carol. The stems - I'll use my imagination. Hope you have some time to plein air paint. Even without the stem these grapes are really nice. I love the ribbon's swirls and the dark bottle. Actually, the whole painting is REALLY great! My condolences to you and your husband. I'm sure he is grateful to have found and meet his birth parents. Looking forward to your paintings from Germany! 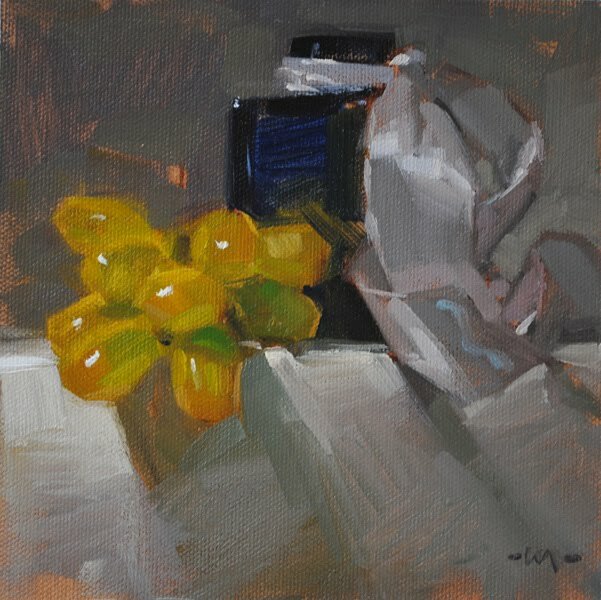 Carol, I love the painting--all the colors in the grapes, the under painting peeking through, the translucency of the bottle. I didn't notice the lack of a stem! Hi Carol, Just want you to know, it's a fabulous painting, with or without the stem. Carol, I'm very sorry to hear of your father-in-law's death. My thoughts and prayers are with all of you. So glad your husband got to meet his birthfather. What a blessing that your husband found and got to spend time with his birth Father before he passed away. Sort of bittersweet. It is great that your husband found is birthparents. Sorry for your loss. Love your paintings and travel stories. Take care and enjoy the rest of your trip. 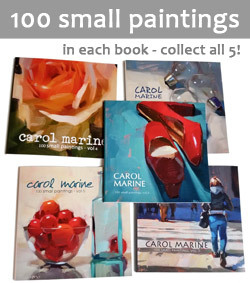 My name is Carol Marine and I love to paint. As of October 5th, 2006, I have been creating one small painting almost every day and posting them here. Most paintings are for bid on Daily Paintworks starting at $100. To be notified by email about each posting, please enter your email address below. A unique holder of panels, designed by David Marine - holds the panel still and allows you to paint off every edge with nothing in the way.